Position: Rest your back against the roller positioned underneath your shoulder blades. Bend your knees so your feet are flat on the floor. Place your hands behind your head, or you can cross your arms over your chest. Roll: Engage your core muscles and raise the hips of the floor so you can slowly roll forward and backwards. The roller should move up and down between the middle of your back and the top of your shoulder blades. Tip: Tuck your chin and try not to look at your legs as you roll. Keep your neck in neutral position. Only go as low as the middle back. It is never a good idea to roll through your lower lumbar spine. Benefits: The thoracic spine is designed for rotation and extension. Stiffness in this area is one of the most common issues we see in office workers. Rounded shoulders and slumped postures place tremendous strain on your spinal ligaments, joints, discs and muscles. Rolling this area will release stress and tension held in the upper shoulders and neck. Position:Lie on your left side with your left arm extended and the roller directly under your left armpit. 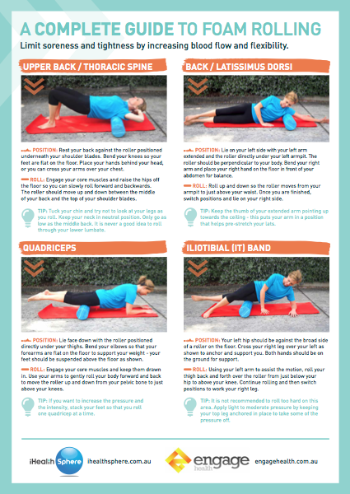 The roller should be perpendicular to your body. Bend your right arm and place your right hand on the floor in front of your abdomen for balance. Roll up and down so the roller moves from your armpit to just above your waist. Once you are finished, switch positions and lie on your right side. Roll: Roll up and down so the roller moves from your armpit to just above your waist. Once you are finished, switch positions and lie on your right side. Tip: Keep the thumb of your extended arm pointing up towards the ceiling - this puts your arm in a position that helps pre-stretch your lats. Benefits: If your lats are tight they are probably not being used as they should be. Most people are very tight under the shoulder blade. Rolling this area will allow the shoulder girdle to sit in better alignment and position.